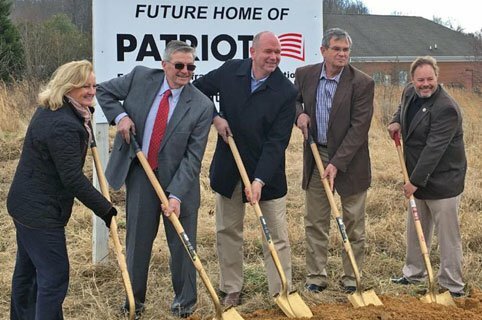 PATRIOT – a full-service facilities and infrastructure solutions provider – recently broke ground on its new headquarters in Dunkirk, Md. The veteran-owned small business is constructing a two-story, 14,000 square-foot facility at the corner of Ward Road and Ferry Landing Road. The new headquarters will provide the space needed to house additional administrative staff and increase the company’s footprint and dedication to Southern Maryland. PATRIOT is known for managing projects for government buildings and was ranked the top global contractor by Deltek’s GovWin IQ for its engineering, architecture, and construction services. The company, which currently employs 40 workers, anticipates moving into the new facility by the end of the year. The homegrown business was founded by two neighbors, John Gilmore and Matt Timbario, just over 10 years ago. What started as a small operation out of a garage has turned into a successful, multi-million dollar company with clients nationwide and across the globe. With the expansion, PATRIOT hopes to add an additional 10 jobs in the county and be considered for additional projects right here in Maryland. The Calvert County Department of Economic Development assisted PATRIOT with its expansion project by pushing the site plan through the review process as fast as possible and fast-tracking permits through the appropriate channels. The Maryland Department of Commerce also met with the company to discuss state programs and assistance for future use. County Administrator Terry Shannon, Commissioner Buddy Hance, PATRIOT Owners Matt Timbario and John Gilmore, and Commissioner Vice President Kelly McConkey. Photo courtesy of Calvert County Department of Economic Development.